Jabuka is a word game that looks like a sack full of coffee beans (the shape was actually inspired by an actual coffee bean). This is because it comes with letter tiles that are shaped like coffee beans and stored in a little burlap sack. Recommended for ages 8 and up, you need 2-8 players for this game. Some of the letters can change if you turn the "bean". For example, flip a "W" over and it becomes an "M". Turn it sideways and it becomes an "E". The cool thing is it's totally organic with no game board and no word grid. The special morphing letter beans can twist and turn to change the letters and create new words! The person who uses the most "beans" and shouts "JABUKA!" is the winner. The great thing about this game is that you can steal you opponent's words by building them up further or even changing them around and adding to them. This is perfect size to carry with you for camping trips or family getaways. A word of warning though, it is addictive! You'll find your self caught up in the excitement; stealing words from the other players , laughing and having a blast. Even my 5 year old is able to play a simplified version of this game. Too often these days children spend their time on the computer, phone or tablet. It's nice to have a game for family game night that requires no computer interaction at all. We need more games like this so children can learn to be less dependent on technology. 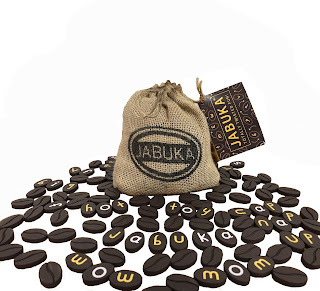 Jabuka retails for $20.00 and can be purchased from their site at www.jabukagames.com or you can purchase it HERE .